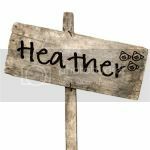 Heather, I think the friend you lost was my neighbor down the road as I was growing up. I cried just a bit tonight when I read about her passing. So know my thoughts are with you, her family and all who loved her. My thoughts and prayers are with you too. 49? I'm 48 with 5 and 7 year old girls....It's makes me shudder! SO glad to see you keeping in touch with your girlfriends. Reminds me I need to pull my circle of friends back together ASAP for some long-missed laughter like only we can do! I'm so sorry for your loss - and the words you wrote are so true. Never take anybody or anything for granted because they (or even you) can be gone tomorrow. It's a hard thing to remember, and this post was a fantastic reminder. I have never done a tried-and-true girls weekend and I have no good explanation! Looks like SO much fun. I love that you girls have stayed friends all these years. That is very rare and special. Congratulations on 10 years. We just celebrated our 14th. It just keeps getting better! And you are right, we never know what is in store. So sorry to hear the news of your friend's passing. love this post heather. Thanks for sharing these aspects of your life. :) hope, love and hugs to you. Thank you all for your kind thoughts and words. Just remember to take time for everyone important in your life and tell them what they mean to you. So true, Heather...all of of us has on earth is today. Hugs. I hope you had a great anniversary! Happy 10 years my friend!